Obesity is a serious health problem, and it is increasing all over the world., Obesity is increasing among urban populations in India and other South Asian parts. As per the World Health Organization (WHO), 19% of the Indian male population and 23% of female population are overweight. In addition, 3.1% male and 6.5% female population are obese in India. As per the National Family Health Survey 2007 in Maharashtra, 15.9% male and 18.1% female are overweight or obese, respectively. Lifestyle changes, urbanization, and socioeconomic status are risk factors for noncommunicable diseases including obesity.,, The alternative therapies for obesity are effective and desirable for its prevention and control. Obesity is considered as imbalance of energy intake and energy expenditure. The excessive intake of sugar and junk food causes deposition of fat. The development of obesity is still not fully known, but it is a multifactorial disease involving many factors such as stress, environment, behavioral, lifestyle, social network, and genetic factors.,, The body composition parameters are better indications to understand the intricacies of obesity. The stress is one of the causes of obesity and the poor quality of sleep. A recent study reported that the association between sleep duration and obesity is not clearly established. Another recent study concluded that body composition and diet are linked to sleep physiology and suggested for dietary interventions for treating the sleep disorders and for improving sleep quality. Furthermore, it is reported that sleep duration is a crucial factor influencing the bodyweight and eating behavior and the recent study concluded that reduced sleep duration is negatively associated with body composition. In addition, there was association between higher fat mass and poor sleep efficiency in two separate studies, one on college students and the other on preschool children. Further, a recent study reported that disturbance in sleep and circadian rhythm are also risk factors for the development of obesity. The endocannabinoid system, a regulator in hedonic feeding, may be the link between sleep, circadian rhythm, and feeding behavior. Also, the variation in gut microbe composition, circadian misalignment, and sleep are linked, in the development of obesity. Further, as per the critical review of published studies on the role of sleep quality on metabolic syndrome, it is concluded that the sleep and metabolic interactions exist and are operational in specific settings. Thus, it is noted that the relation between sleep diet and body composition parameters are complex, and specific study of these causative factors, applicable to the urban male adults, will be rewarding. The obesity standard is different for different ethnic groups. The WHO definition is that body mass index (BMI) ≥25 kg/m2 is overweight and BMI ≥30 kg/m2 is obesity. However, for Asian population, BMI cutoff points are lesser and BMI above 23 kg/m2 is considered as overweight and above 25 kg/m2 is considered as obese., In the current study, we have considered aforementioned standard for the obese adults. The present methods for controlling the obesity are bit expensive with many limitations and it will be useful if alternative methods are validated. Yoga is one of the ancient mind–body therapies from India, consisting of specific yoga postures, breathing practices, and meditation techniques for the treatment of obesity. According to sage Patanjali, the essence of yoga is to control over the turbulent mind (circa. 400 BC, P.Y.S. Chapter I, Verse II). Previous studies have shown that the psychosomatic diseases are effectively prevented and controlled by yogic practices. A very recent systematic review study from 30 trials compared from the 441 records, on effects of yoga on weight-related outcome, reported that yoga can be preliminarily considered as safe and effective intervention for weight reduction. However, it was reported that, though obese or overweight individuals had effect on the BMI reduction, these effects were not robust against selection bias. Yoga and body composition studies along with sleep parameters are very limited. Further, the earlier studies were lacking the assessments of specific urban working male subjects which is done in the current randomized controlled study. In addition, the yoga practice requires minimum space and investments compared to many other physical activities. Thus, it is prudent to explore the yoga therapy for long-term weight reduction in urban adults. Therefore, the present study is intended to investigate the effect of 14 weeks yoga training on body composition and sleep quality in obese adults. Total of 80 obese male participants were enrolled in the present study. The sample size was calculated based on the prior study of Dhananjai et al. using an open source software G*Power., In the earlier study on obesity, hip circumference had the lesser effect size and considering this parameter the minimum sample size was 29. The power of sample size used was 0.9. In the current study, of 80 participants enrolled, 8 were dropout and 72 completed the intervention. The integrated approach of yoga therapy (IAYT) was imparted to yoga group for 1½ h for 5 days in a week, for 14 weeks. The yoga intervention details are given in [Table 1]. No specific physical exercise was administered to the control group, but they were asked to continue their regular normal routine. All participants were recruited by advertisement and telephone messages in Anushakti Nagar, Mumbai, India. The trial profile of the study is given in [Figure 1]. (i) BMI between 23 kg/m2 and 35 kg/m2, (ii) only male adult ages from 18 to 60 years, and (iii) normal health for doing simple yoga practices. No participants were trained to yoga practices before were included. (i) Individuals who had surgery in the past 6 months, (ii) any other neurological or psychiatric problems, and (iii) other health conditions (such as pain and injury) were unsuitable for doing yoga were excluded from the study. All participants were randomized into two groups with minimization of cofactors by an open source software program MinimPy., The study was approved by the Institutional Ethical Committee, and informed consent was obtained from each participant. Both groups received their respective measurement values food log format and basic sample meal plan prepared for sedentary male adults based on standard guidelines. The Pittsburgh Sleep Quality Index (PSQI) is one of the validated scales for assessing the quality of sleep applicable for various groups. PSQI questionnaire was used for the assessment of quality of sleep. This contains 19 items and gives 7 component scores of subjective sleep quality (slpq), sleep latency, duration, habitual sleep efficiency (hsle), sleep disturbance, sleep medication, and daytime dysfunction. In addition, there is a global score on quality of sleep. The maximum global score is 21. PSQI score more than 5 is considered as poor quality. This scale is validated in different populations (with Cronbach's alpha 0.8) and is an effective screening tool., In earlier studies, the global PSQI score >5 got diagnostic sensitivity of 89.6% and specificity of 86.5% (κ = 0.75, P < 0.001) for differentiating poor and good sleepers. The questionnaire was filled by individuals in hard copy in single sitting in a comfortable position, before body composition assessments. There are different methods for the body composition assessment. Bioelectrical impedance (BIA) principle was used in the current study for body composition assessments. The InBody, Maltron, Tanita, etc., are some of the validated instruments. In the current study, we have used InBody R20 instrument to assess the different indices of body composition in obese adults. BIA principle was used to estimate body composition and is a non invasive method.,,,, The InBody R20 is a validated scale for BIA which is used for scientific studies on obesity. The major outcomes are weight, body fat mass, percentage body fat, skeletal muscle mass, BMI, basal metabolic rate (BMR), waist-hip ratio, total body water, fat-free mass (FFM), segmental muscle mass and segmental fat mass, and mineral mass (Mm). The readings were taken with empty stomach in the morning for both pre-post readings. The body composition was assessed in the morning with overnight fasting. The instrument used was InBody R20 (Sr. No PA 904F1D1 of M/s Bio space Co. Ltd.,) from the UK, and the same instrument was used for measurements of both before and after the intervention. All accessories metallic items were removed from pockets and the participants were asked to stand straight and still on the foot pad with light clothing. The foot was placed in the foot pad as per the shape of the electrode guide. First, the body weight was registered and then they were asked to hold the hand grips properly without moving the body. The readings were directly transferred to the connected computer. The height was measured using anthropometric inelastic tape. PSQI contains 19 self-rated questions for scoring. The 19 questions are combined to form seven component score, each of which has a range of 0–3 points. Zero indicates no difficulty and 3 indicates severe difficulty. The seven components are added together to get global score with a range of 0–21 points, 21 indicating severe difficulty in all the areas. After scoring 7 components and the global score, as per the scoring procedure, the data were coded, tabulated, screened, and carried out the data entry for processing. The InBody R20 instrument was connected by universal serial bus to computer while taking the individual assessments and the raw data of the individual body composition parameters were recorded in computer during assessment. The coded and tabulated data were screened and transferred to single excel sheet in the requisite format for analysis. This statistical package for the social sciences(SPSS) owned by IBM version was used for the data analysis. The data were analyzed for normality using Shapiro-Wilk test. Further, for all the pre-post values of both yoga and control groups, the paired sample t-test was carried out, on all the variables which were found normally distributed. The body composition parameters and PSQI global score distribution were found normal, but the seven components of PSQI were not normal. For these seven components of PSQI, nonparametric test was carried out using Wilcoxon signed-rank test. The between-groups analysis was performed using the independent sample t-test for the pre and post values of yoga and control groups. To find the relative improvement among the variables, the change in each variable was correlated each other. In the analysis, P < 0.05 was considered statistically significant. The baseline demographic educational and anthropometric data were found similar. In yoga group, the age of individuals ranged from 26 to 60 and in control group from 21 to 58 years. 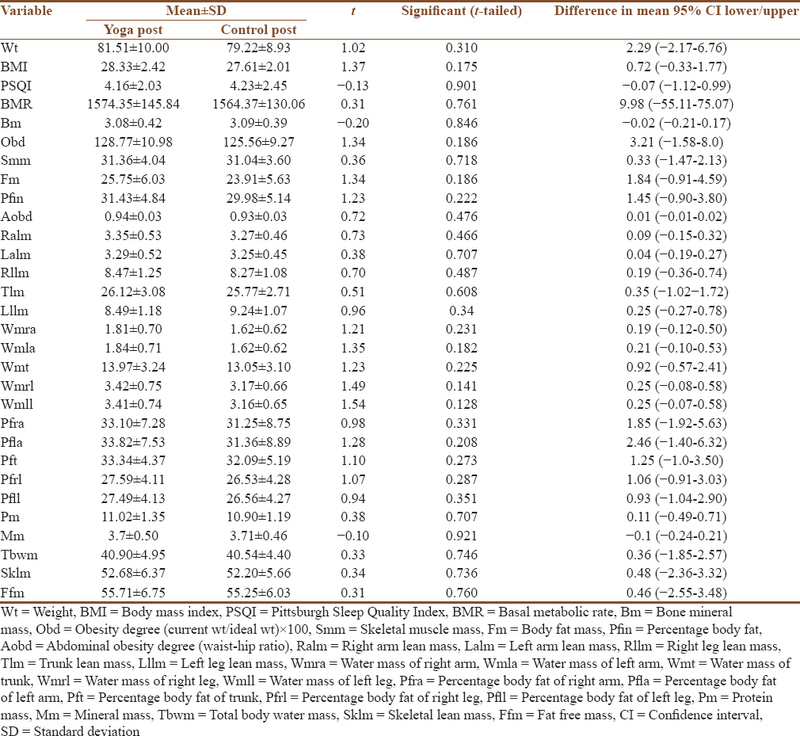 The baseline data of age and height are given in [Table 2]. The yoga group BMI ranged from 25.33 kg/m2 to 34.84 kg/m2 (mean ± standard deviation [SD]; 28.7 ± 2.35 kg/m2) and for the control group it was from 25.01 kg/m2 to 33.64 kg/m2 (mean ± SD; 27.70 ± 2.05 kg/m2). For all participants, BMI was found above 25 kg/m2. The 50% of individuals in each group was with age between 18 and 40 years and 50% were in age group of 40–60 years. Similarly, education of half of each group was up to degree and balance half was post graduate or above. The within-group analysis results are given in [Table 3]. In both the groups, the PSQI global score was improved but the improvement was significant (P < 0.02) in yoga group alone. The PSQI global score of 5 and above is considered as poor quality. Before the intervention, PSQI global score was more than 5, in the yoga group and there was 18% improvement in the score. The score improved to good quality (4.16 ± 2.03) after the intervention. The body weight in the yoga and control groups decreased after intervention. However, the weight reduction was significant in yoga group (P = 0.004) alone. Similarly, improvement in the BMI was significant in yoga group (P < 0.01) alone. In addition, reduction in bone mass (Bm) and mineral mass (Mm) (P < 0.02) and obesity degree (current weight divided by ideal weight multiplied by 100) (P < 0.01) were significant in yoga group and no change in control group. In both groups, both the arm lean masses increased whereas in control group trunk lean mass also increased. In both the groups, all other body composition parameters were reduced. The seven component PSQI scores of yoga and control groups are given in [Table 4] and [Table 5], respectively. In the yoga group, out of 7 PSQI components, 5 showed the improvement in trends from pre to post and the balance two components, (hsle; P < 0.02) and (slpq; P < 0.03), reported significant improvement. The global score of PSQI showed significant improvement in yoga group alone. In the control group, though the component of slpq improved (P < 0.04), the use of sleep medication and daytime dysfunction showed increasing (worsened) trend. In the between-group analysis, the changes were not significant in pre as well as in post readings. The postintervention between-group analysis results are given in [Table 6]. To find out the relative improvements (from pre to post) among the variables, each variable was correlated with each other. The outcome is summarized in [Table 7]. There was a significant positive correlation of BMI with protein mass (r = 0.308, P < 0.01), Mm (r = 0.227, P < 0.05), bone mass (r = 0.233, P < 0.05), BMR (0.237, P < 0.01), fat mass (0.511, P < 0.01), FFM (0.0.324, P < 0.01), total body water (r = 0.324, P < 0.01), skeletal muscle mass (r = 0.326, P < 0.01), and PSQI score (r = 0.201, P < 0.05). It was also found that FFM is strongly and positively correlated to BMR. None of the participants reported any adverse effect of yoga intervention. The aim of the current study was to find out the effects of 14 weeks IAYT intervention on body composition and sleep parameters. As an outcome of intervention, the PSQI global score as well as the slpq and sleep efficiency components were improved with significance, which was consistent with the improvements in body composition parameters. The body weight, obesity degree, BMI, bone mass, and Mm were reduced with significance in yoga group alone. Further, there was a trend of improvement in all the body composition parameters in yoga group. In the current study of 1st time yoga doers, the slpq and efficiency scores improved 34.6% and 54%, respectively. This shows the possibility of the yoga intervention in combating the obesity difficulties in urban setting. Further, as reported earlier, sleep parameters play a key role in energy metabolism, and the current study shows improvement in both sleep quality and body composition parameters. A recent previous study assessing the circadian measures (i.e., melatonin and cortisol) in middle-aged men showed evidence of association of altered circadian rhythms with reduced melatonin response and cognitive impairment. This previous study showed a link between circadian rhythms sleep and cognition. Further, recent previous cross-sectional study showed that the yoga practice reduces the cortisol levels anxiety and depression. In addition, relaxation induced by diaphragmatic breathing decreases the oxidative stress and cortisol levels. The hatha yoga practices reduce psychological stress and affective eating as per previous studies. In the current study, yoga practice might have reduced the cortisol levels and oxidative stress, effecting improvement in the sleep quality. Stress is cause for many diseases in urban life as reported in many previous studies. The stress causes the immediate and long-term disturbance in the psychoneuroendocrine and immunological pathways. The hypothalamus pituitary adrenal (HPA) axis and sympathetic nervous system gets adversely affected and hyperactivated by influx of emotions from limbic system under the mental stress. This increases the release of hormones of cortisol and catecholamine. The repeated state of “fight or flight” mode makes the HPA axis firing continuously and disrupting the homeostasis leading to metabolic disorders. Most of the yogic practices promote parasympathetic activation and regulation and normalization of HPA axis. In addition, the yoga practices give vagal stimulation reducing heart rate and blood pressure. The metabolic and psychological parameters were improved by balance in the HPA axis, insulin resistance, and lipid metabolism. Further previous studies showed that insufficient sleep is linked to increase in obesity,, especially the visceral adipose tissue., In the current study, the sleep duration of yoga group increased along with significant reduction in abdominal obesity degree. The relation between sleep duration and obesity is not linear, and the poor sleep and emotional stress are mediating factors in obesity. Thus, in the real life setting, the extending of sleep is found to promote reducing the desire for high energy foods. This might have affected the weight reduction. Also, as reported previously, the emotional stress and poor sleep are mediating factors in the relationship between obesity (expressed in body composition parameters) and sleep duration. The sleep duration affects the body composition and may be more time period of intervention needed to get more significant results. In addition, studies reported the role of certain type of diet pattern, affecting the quality of sleep. In the current study, there was no restriction on food though the sample meal plan was provided to both the groups and the inputs on diet information were equal to both the groups. There are studies on the effect of the leptin and adiponectin hormones which effects out the satiety center in hypothalamus. The leptin and adiponectin helps regulate the energy balance by inhibiting the hunger. A recent study of 12 weeks yoga-based lifestyle intervention program showed significant reduction in serum leptin levels with improvements in anthropometric parameters. The frequency of self-reported yoga practice showed a significant negative relationship with leptin and also with adiponectin to leptin ratio. Further previous studies showed that intensive yoga practice has beneficial health consequences in body weight due to changes in leptin and or adiponectin. The metabolic improvements obtained in the current study may be due to energy homeostasis effected by leptin and adiponectin. Further, the circadian misalignment in urban lifestyle is a predominant factor and this leads to adverse effect in energy balance. The endocannabinoid system is signaling the pathways to modulate the metabolic functions., The uncontrolled binge eating behavior inherent with easy availability of junk food in the urban lifestyle further promotes the unbalance in energy intake and expenditure. The endocannabinoid signaling is reported as neurochemical mechanism in response to stress and endocannabinoid system is chronically unregulated due to stress, promoting the drive to eat merely out of pleasure, in the absence of any energy deficit. A recent study on effect of exercise on endocannabinoid on male rats with high-fat diet induced obesity indicated a reversal of metabolic syndrome. The current study of yoga intervention also includes loosening exercises and süryanamaskära along with other yoga techniques. The overactivation of the endocannabinoid system is reduced by the yoga practices as evident from the metabolic improvements. The two parameters of body composition, bone mineral (Bm) content and Mm, may increase after sufficiently long period. Previous study showed that compared to sedentary people, the marathoners (both male and female) had higher bone stiffness and density. Furthermore, a systematic review on Bm accrual by exercise reported increase in Bm with weight-bearing exercise, in children and adolescents, after 6 months. Unlike the physical exercise, the yoga practice was reported to decrease the Bm and Mm values in the beginning. After sufficiently longer period, the Bm and Mm showed increasing trend. In the recent study of yoga intervention on weight reduction, the Bm started increasing in the beginning, and after 22 months of yoga practice, Bm started decreasing. It was noted that there is a complex relationship between adiposity and bone tissue. The physiopathological participation of adiposity in homeostasis of bone involves adipokines remodeling. These molecules released from fat cells interfere in the bone metabolism and the different degrees of body weight will differently interfere with Bm. The serum leptin is inversely associated with Bm density and strongly associated with fat mass. The yoga training involved asana pranayama meditation and other awareness components which might have made the mind peaceful and influenced the homeostasis positively. The psychoneuroendocrine and immune mechanism systems are improved by yoga practice reducing the stress and improving the balance of the systems. Further, in the body composition, the fat mass is negatively correlated and FFM is positively correlated to Bm and Mm in the current study, as reported in previous studies. Thus, the weight reduction achieved by intervention is also by reduction in the FFM. Ideally, the fat is to be reduced and lean body mass is to be increased after doing yoga. In yoga group, the left arm lean mass and right arm lean mass showed increasing trend and more duration of yoga practice may be required for improvement with significance. In the control group, in addition to improvements in arm lean mass, trunk lean mass also showed increasing trend. This may be due to the physical activities of the control group. It was also found that the BMI was strongly correlated to FFM and the BMR as reported earlier. The eating behavior and sleep act together and affect weight reduction. The current study showed that BMI was positively correlated to global score of PSQI and the slpq influenced the weight reduction. Thus, the weight reduction in yoga group is due to the improvement in the stress sleep and eating patterns caused by yoga training. The current study was one of the early studies with sleep and body composition exclusively for obese male adults in an urban setting. The study showed that IAYT reduces the obesity and improves sleep quality. In the current study, the same instruments including InBody R20 were used for both the pre and post assessments since the measurement by different analyzers will be misleading. In the current study, the control group was not given chance to gather together, which is a form of social cohesion. In the yoga group, the social cohesion also might have affected stress reduction and sleep quality. Although the food log format and sample food plan were given for information to the individuals, diet pattern of the participants was not assessed. Above are considered as limitations of the study. Although the minimization of cofactors was done to have balance between the two groups, the age range was noted large in the current study. For future studies, narrow range of age and trials at different urban cities, having different food habits can be considered. Yoga intervention will be effective for controlling the obesity in male and improving their quality of life. The body composition parameters sleep quality were improved due to yoga intervention. The authors acknowledge with thanks the yoga circle, Anushakti Nagar, Mumbai, for the help in conducting the specified IAYT yoga class. NCD Risk Factor Collaboration. Trends in adult body-mass index in 200 countries from 1975 to 2014: A pooled analysis of 1698 population-based measurement studies with 19·2 million participants. Lancet 2016;387:1377-96.
WHO Obesity. World Health Organization. Available from: http://www.who.int/topics/obesity/en/. [Last cited on 2016 Mar 31]. Kalra S, Unnikrishnan AG. Obesity in India: The weight of the nation. J Med Nutr Nutraceuticals 2012;1:37. Yadav K, Krishnan A. Changing patterns of diet, physical activity and obesity among urban, rural and slum populations in North India. Obes Rev 2008;9:400-8. Ramachandran A, Snehalatha C. Rising burden of obesity in Asia. J Obes 2010;2010. pii: 868573. Dhurandhar N. Obesity in India: Opportunities for clinical research. J Obes Metab Res 2014;1:25. Dehghan M, Akhtar-Danesh N, Merchant AT. Childhood obesity, prevalence and prevention. Nutr J 2005;4:24. Karnik S, Kanekar A. Childhood obesity: A global public health crisis. Int J Prev Med 2012;3:1-7. Thayer KA, Heindel JJ, Bucher JR, Gallo MA. Role of environmental chemicals in diabetes and obesity: A National Toxicology Program workshop review. Environ Health Perspect 2012;120:779-89. Christakis NA, Fowler JH. The spread of obesity in a large social network over 32 years. N Engl J Med 2007;357:370-9. Theorell-Haglöw J, Lindberg E. Sleep duration and obesity in adults: What are the connections? Curr Obes Rep 2016;5:333-43. Spaeth AM, Dinges DF, Goel N. Objective measurements of energy balance are associated with sleep architecture in healthy adults. Sleep 2016. pii: Sp-00253-16. Poggiogalle E, Lubrano C, Gnessi L, Marocco C, Di Lazzaro L, Polidoro G, et al. Reduced sleep duration affects body composition, dietary intake and quality of life in obese subjects. Eat Weight Disord 2016;21:501-5. Kahlhöfer J, Karschin J, Breusing N, Bosy-Westphal A. Relationship between actigraphy-assessed sleep quality and fat mass in college students. Obesity (Silver Spring) 2016;24:335-41. Butte NF, Puyau MR, Wilson TA, Liu Y, Wong WW, Adolph AL, et al. Role of physical activity and sleep duration in growth and body composition of preschool-aged children. Obesity (Silver Spring) 2016;24:1328-35. Broussard JL, Van Cauter E. Disturbances of sleep and circadian rhythms: Novel risk factors for obesity. Curr Opin Endocrinol Diabetes Obes 2016;23:353-9. Koren D, Dumin M, Gozal D. Role of sleep quality in the metabolic syndrome. Diabetes Metab Syndr Obes 2016;9:281-310. Snehalatha C, Viswanathan V, Ramachandran A. 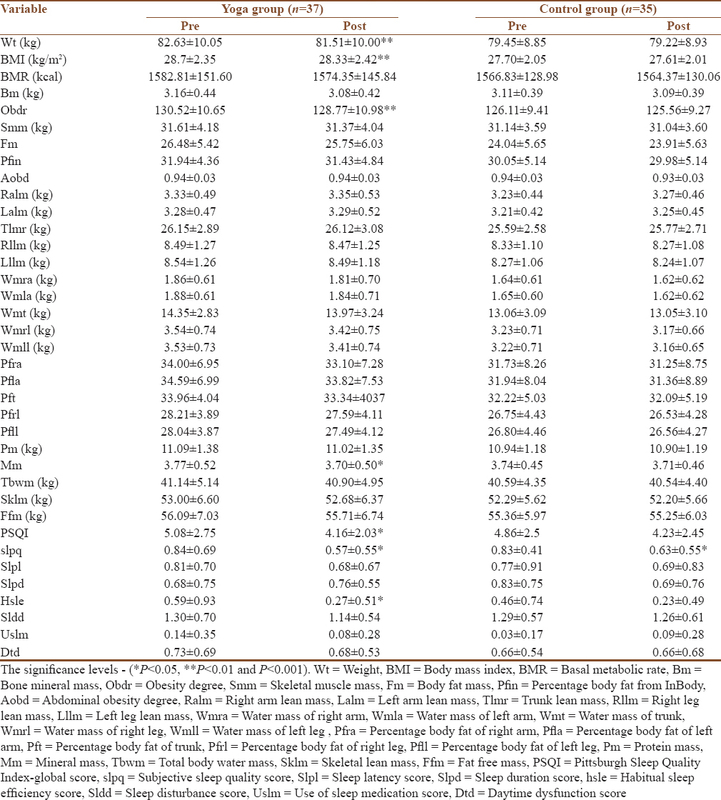 Cutoff values for normal anthropometric variables in asian Indian adults. Diabetes Care 2003;26:1380-4. Mini Sheth NS. The Scientific Way to Managing Obesity. 2011th ed. New Delhi: Sterling Publishers; 2011. Taimini IK. The Science of Yoga. 1st ed. 12th reprint. Chennai: The Theosophical Society Adayar; 2010. Udupa K. Stress and its Management by Yoga. 2nd ed. Delhi: Motilal Banarsidass Publishers Pvt. Ltd.; 2000. Lauche R, Langhorst J, Lee MS, Dobos G, Cramer H. A systematic review and meta-analysis on the effects of yoga on weight-related outcomes. Prev Med 2016;87:213-32. Dhananjai S, Sadashiv, Tiwari S, Dutt K, Kumar R. Reducing psychological distress and obesity through Yoga practice. Int J Yoga 2013;6:66-70. Faul F, Erdfelder E, Lang AG, Buchner A. G*Power 3: A flexible statistical power analysis program for the social, behavioral, and biomedical sciences. Behav Res Methods 2007;39:175-91. Saghaei M. Implementation of an open-source customizable minimization program for allocation of patients to parallel groups in clinical trials. J Biomed Sci Eng 2011;4:734-9. Scott NW, McPherson GC, Ramsay CR, Campbell MK. The method of minimization for allocation to clinical trials. A review. Control Clin Trials 2002;23:662-74. National Institute of Nutritiion DIETARY GUIDELINES – A Manual; 2011. Available from: http://www.nin.org/. [Last cited on 2016 Aug 08]. Smyth C. The Pittsburgh Sleep Quality Index (PSQI). Insight 2000;25:97-8. Buysse DJ, Reynolds CF 3rd, Monk TH, Berman SR, Kupfer DJ. The Pittsburgh Sleep Quality Index: A new instrument for psychiatric practice and research. Psychiatry Res 1989;28:193-213. Mollayeva T, Thurairajah P, Burton K, Mollayeva S, Shapiro CM, Colantonio A. The Pittsburgh Sleep Quality Index as a screening tool for sleep dysfunction in clinical and non-clinical samples: A systematic review and meta-analysis. Sleep Med Rev 2016;25:52-73. Carpenter JS, Andrykowski MA. Psychometric evaluation of the Pittsburgh Sleep Quality Index. J Psychosom Res 1998;45:5-13. Dolezal BA, Lau MJ, Abrazado M, Storer TW, Cooper CB. Validity of two commercial grade bioelectrical impedance analyzers for measurement of body fat percentage. J Exerc Physiol Online 2013;16:74-83. Jensky-Squires NE, Dieli-Conwright CM, Rossuello A, Erceg DN, McCauley S, Schroeder ET. Validity and reliability of body composition analysers in children and adults. Br J Nutr 2008;100:859-65. Buffa R, Saragat B, Cabras S, Rinaldi AC, Marini E. Accuracy of specific BIVA for the assessment of body composition in the United States population. PLoS One 2013;8:e58533. Mattsson S, Thomas BJ. Development of methods for body composition studies. Phys Med Biol 2006;51:R203-28. Kyle UG, Bosaeus I, De Lorenzo AD, Deurenberg P, Elia M, Manuel Gómez J, et al. Bioelectrical impedance analysis-part II: Utilization in clinical practice. Clin Nutr 2004;23:1430-53. Ruiz JR, Segura-Jiménez V, Ortega FB, Alvarez-Gallardo IC, Camiletti-Moirón D, Aparicio VA, et al. Objectively measured sedentary time and physical activity in women with fibromyalgia: A cross-sectional study. BMJ Open 2013;3. pii: E002722. Filiatrault ML, Chaput JP, Drapeau V, Tremblay A. Eating behavior traits and sleep as determinants of weight loss in overweight and obese adults. Nutr Diabetes 2014;4:e140. Markwald RR, Melanson EL, Smith MR, Higgins J, Perreault L, Eckel RH, et al. Impact of insufficient sleep on total daily energy expenditure, food intake, and weight gain. Proc Natl Acad Sci U S A 2013;110:5695-700. Spaeth AM, Dinges DF, Goel N. Effects of experimental sleep restriction on weight gain, caloric intake, and meal timing in healthy adults. Sleep 2013;36:981-90. Waller KL, Mortensen EL, Avlund K, Fagerlund B, Lauritzen M, Gammeltoft S, et al. Melatonin and cortisol profiles in late midlife and their association with age-related changes in cognition. Nat Sci Sleep 2016;8:47-53. Katuri KK, Dasari AB, Kurapati S, Vinnakota NR, Bollepalli AC, Dhulipalla R. Association of yoga practice and serum cortisol levels in chronic periodontitis patients with stress-related anxiety and depression. J Int Soc Prev Community Dent 2016;6:7-14. Martarelli D, Cocchioni M, Scuri S, Pompei P. Diaphragmatic breathing reduces exercise-induced oxidative stress. Evid Based Complement Alternat Med 2011;2011:932430. Hopkins LB, Medina JL, Baird SO, Rosenfield D, Powers MB, Smits JA. 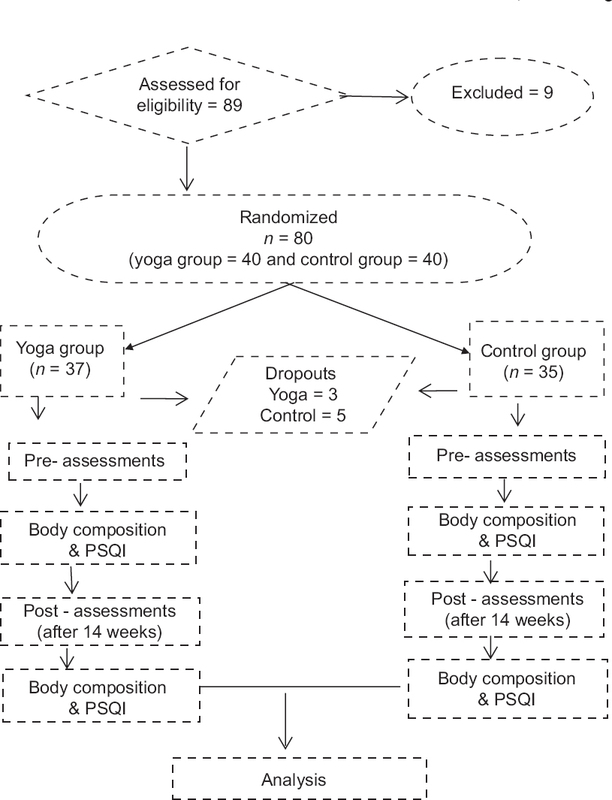 Heated hatha yoga to target cortisol reactivity to stress and affective eating in women at risk for obesity-related illnesses: A randomized controlled trial. J Consult Clin Psychol 2016;84:558-64. Jarrin D, Mcgrath J, Drake C. Beyond sleep duration: Distinct sleep dimensions are associated with obesity in children and adolescents. Sleep Med 2013;14:e159. Taheri S, Lin L, Austin D, Young T, Mignot E. Short sleep duration is associated with reduced leptin, elevated ghrelin, and increased body mass index. PLoS Med 2004;1:e62. Chaput JP, Bouchard C, Tremblay A. Change in sleep duration and visceral fat accumulation over 6 years in adults. Obesity (Silver Spring) 2014;22:E9-12. Calvin AD, Carter RE, Adachi T, Macedo PG, Albuquerque FN, van der Walt C, et al. Effects of experimental sleep restriction on caloric intake and activity energy expenditure. Chest 2013;144:79-86. Tasali E, Chapotot F, Wroblewski K, Schoeller D. The effects of extended bedtimes on sleep duration and food desire in overweight young adults: A home-based intervention. Appetite 2014;80:220-4. Schäfer AA, Domingues MR, Dahly DL, Meller FO, Gonçalves H, Wehrmeister FC, et al. Sleep duration trajectories and body composition in adolescents: Prospective birth cohort study. PLoS One 2016;11:e0152348. St-Onge MP, Mikic A, Pietrolungo CE. Effects of diet on sleep quality. Adv Nutr 2016;7:938-49. Yadav R, Yadav RK, Khadgawat R, Mehta N. OS 28-06 beneficial effects of a 12-week yoga-based lifestyle intervention on cardio-metabolic risk factors and adipokines in subjects with pre-hypertension or hypertension. J Hypertens 2016;34 Suppl 1:e252. Kiecolt-Glaser JK, Christian LM, Andridge R, Hwang BS, Malarkey WB, Belury MA, et al. Adiponectin, leptin, and yoga practice. Physiol Behav 2012;107:809-13. Bellocchio L, Vicennati V, Cervino C, Pasquali R, Pagotto U. The endocannabinoid system in the regulation of cardiometabolic risk factors. Am J Cardiol 2007;100:7P-17P. Di Marzo V, Ligresti A, Cristino L. The endocannabinoid system as a link between homoeostatic and hedonic pathways involved in energy balance regulation. Int J Obes (Lond) 2009;33 Suppl 2:S18-24. Gamelin FX, Aucouturier J, Iannotti FA, Piscitelli F, Mazzarella E, Aveta T, et al. Effects of chronic exercise on the endocannabinoid system in Wistar rats with high-fat diet-induced obesity. J Physiol Biochem 2016;72:183-99. Touati S, Meziri F, Devaux S, Berthelot A, Touyz RM, Laurant P. Exercise reverses metabolic syndrome in high-fat diet-induced obese rats. Med Sci Sports Exerc 2011;43:398-407. Lara B, Salinero JJ, Gutiérrez J, Areces F, Abián-Vicén J, Ruiz-Vicente D, et al. Influence of endurance running on calcaneal bone stiffness in male and female runners. Eur J Appl Physiol 2016;116:327-33. Hind K, Burrows M. Weight-bearing exercise and bone mineral accrual in children and adolescents: A review of controlled trials. Bone 2007;40:14-27. Lu YH, Rosner B, Chang G, Fishman LM. Twelve-minute daily yoga regimen reverses osteoporotic bone loss. Top Geriatr Rehabil 2016;32:81-7. Mosca LN, da Silva VN, Goldberg TB. Does excess weight interfere with bone mass accumulation during adolescence? Nutrients 2013;5:2047-61. Morberg CM, Tetens I, Black E, Toubro S, Soerensen TI, Pedersen O, et al. Leptin and bone mineral density: A cross-sectional study in obese and nonobese men. J Clin Endocrinol Metab 2003;88:5795-800. Jain R, Venkatasubramanian P. Proposed correlation of modern processing principles for Ayurvedic herbal drug manufacturing: A systematic review. Anc Sci Life 2014;34:8-15. Júnior IF, Cardoso JR, Christofaro DG, Codogno JS, de Moraes AC, Fernandes RA. The relationship between visceral fat thickness and bone mineral density in sedentary obese children and adolescents. BMC Pediatr 2013;13:37. Lazzer S, Bedogni G, Lafortuna CL, Marazzi N, Busti C, Galli R, et al. Relationship between basal metabolic rate, gender, age, and body composition in 8,780 white obese subjects. Obesity (Silver Spring) 2010;18:71-8. Kutac P, Kopecky M. Comparison of body fat using various bioelectrical impedance analyzers in university students. Acta Gymnica 2015;45:177-86.